Game Play: All the clues to solve the riddles can be found and picked up on the views or scenes of the game play and/or in the documentary base (Keywords) usually found in the riddle mode. Listening to the dialogue of the characters also reveals clues. All the characters and items that can be picked up while searching the documentary base or on on the scenes are usually used in later riddles making the inventory large. Picking them up as found will save time looking for them when needed. The actual puzzles are solved in the riddle mode. At the bottom of the screen, the return database and volume controls can be found. The database is useful in picking up items or characters needed without going through a lot screen changes. On the top of the screen is the link to the Riddle, Document and Map pf the World. There is only an automatic save that goes back to the start of an unfinished riddle. Philippe, the King of France arrives at Dun-Le-Roy, to make an example of Arthaud, Lord of Dun-Le-Roy and mete punishment for his burning a monastery. On a wooded hilltop littered with projectiles and stony rubble, the troops prepare the siege of the fortress. Philippe standing on a dangerous counterscarp looks over the castle, while a winch man below prepares the Trebuchet. Place the 1) stony rubble in the box, 2) the projectile by the line and 3) the winch man by the hoist of the engine. The launching of the catapult was the signal to start the attack on the fortress and the walls of the castle collapsed. In preparation for digging a tunnel to get into the castle keep, the army cuts down wood and a carpenter prepares wooden struts to hold up the tunnel at the wooded hilltop. While at the counterscarp, a sentry and sappers warm themselves by the fire. The army has entered the courtyard of the fort and is getting ready to tunnel under the Castle keep. The Cat was broken during the attack and wooden planks are taken from it for reuse. Place on 1) Armenian Engineer - he draws the plan for the tunnel, 2) Sapper - starts to dig the tunnel, click on the ground following the plan set by the engineer. Upon the middle of the horizontal tunnel, 3) place the Carpenter, who builds a strut to hold the the tunnel. Continue digging until the sapper reaches underneath the keep. Place on 4) Planks under the keep to built a fire and destroy the keep. The Keep falls and Arthaud is captured. The collapsed keep destroys the chapel. In the destroyed chapel, Arthaud makes a valiant effort to defend himself to no avail. Philippe makes an example of Arthaud by declaring to entomb him and orders the chapel rebuilt. The courtyard shows the destruction made by the army. A Knight Hospitaller discusses the rebuilding of the chapel with Friar Audet, a Monk sculptor. At the now denuded wooded hilltop, a stonecutter watches over the cutting of stones for the chapel. A. Copy the diagram of the chapel on the left page using the arrow and the cross icon, on and around the red circle (Symbol of God). B. Then, place 1) the foreman or master mason on the square and compass, 2) squarer on the pick and axe, 3) the stone cutter on the square and burin, 4) mortar mixer on the bucket and spade, 5) traveling metal smith on the bell, 6) monk sculptor on the mallet and chisel. Arthaud was entombed at the rebuilt chapel. Throughout his stay in that dark gloomy pit, he was unrepentant. 3 years later in 1183 AD, the tomb was opened and he was released. In that gloomy chapel in Dun-Le-Roy, Philippe, based on the words of William of Tyre, offers Arthaud a chance to redeem himself by offering him to go a pilgrimage to Jerusalem. The castle grounds and surrounding landscape are inhospitable and desolate as ever. By order of King Philippe, the castle is never to be rebuilt. Place Henry II Plantagenet on England, The Pope on Rome, Frederick Barbarossa on Holy Roman Empire, Andronicus 1st Comnenus on Byzantine Empire, Saladin on Egypt, Baldwin IV on Jerusalem. Note: Fire has been add to the inventory. King Philippe informs Arthaud about the court intrigue in Jerusalem and the Frankish States in the East. King Baldwin IV, dying from leprosy, is in the process of choosing his successor. 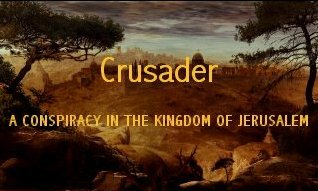 Intrigues by greedy courtiers, barons, and prelates cause deterioration of the Jerusalem court and a possibility of a plot to overthrow the Frankish dynasty. The court is oblivious to the threat of Saladin, Grand Sultan of Egypt and Syria. Philippe wants to restore order to the Jerusalem court. He tells Arthaud that to gain freedom, he is to steal the relics of the Holy Cross and bring them back to France within one year. Arthaud travels to St. Gilles. In preparation for the trip to Jerusalem, Arthaud stays at the commandery of the Knights Templar led by Seneschal Gerard de Ridefort. In an alley lined by sacks of quicklime and full of traders selling dried meat and such, a victualler and a sea guide discuss sea voyaging. A Carthusian monk cat watches all the activity. At the seaport, a group of men with wine at easy reach plays a game. A store sells fresh fruits. A carpenter-caulker stand in wait to travel to the Holy Land and some Knights Templar discuss the threat of pirates and fortifying the ship with fire bolts and catapults. Watching the loading of the Venetian trading ship, Lucina is a coastal pilot. At the commandery, sacks of sulphur are stored. Gerard, the Seneschal and the Doge of Venice bring up the possibility of opportunities and richness to be obtained in the East. Place the fruits, dried meat, cat and the wine on the Hold. Place the carpenter-caulker on the deck, the victualler on the afterdeck, the navigator on the rudder, coastal pilot and catapult on the forecastle, bags of lime or sulphur on the foredeck. While inquiring about his passage to the East, Arthaud ponders on the words of the Doge and Seneschal. Gerard of Ridefort beside the Doge gives advice to Arthaud, now aboard the Lucina. Nearby the Genoan Consul stands with some pilgrims discussing the variety of ships and dangers of the voyage. At the commandery, a Norman navigator converse with a former Moorish pirate, while the Pisan consul dines. Place the Pisan consul on Cagliari, the Norman on Palermo/Southern Sicily, Moorish pirate on Bougres/north of Africa, Doge of Venice on Ragusa, Genoan consul on Bontifacio, The Pope on Rome, Andronicus 1st Comnenus on Rhodes/Byzantine Empire. B. Mark a safe route from St. Gilles to St Jean d'Acre with only 2 call to port. Click on black circles to draw a line from St. Gilles to St. Jean d'Acre with stopovers on Messina and Candia. The fleet departs St. Gilles and Arthaud ponders on the advice given and the relationship between the Doge and the Seneschal. Egyptian pirates attack the fleet. The forecastle is filled with Templars calling to arms and pilgrims in fear. Standing by the poop deck, sack of quicklime and pots of sulphur can be seen. 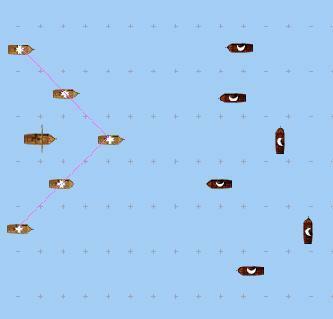 Arrange the Frankish ships in a V formation using the arrow and the cross icons on the left side of the frame, facing the enemy with the Lucina at the center. Pick up the Cabling and drop it on one of the end ship to connect them. Place the naphtha, pitch tar, sulfur, quicklime and saltpeter on the firepot. When the fighting has ended, Arthaud finds himself and the ship alone in the vast sea. Searching the ship, he finds a stowaway, Al Harawi, our storyteller. Al Harawi convinces Arthaud that he is needed for piloting the ship to St. Jean d'Acre. Al Harawi wonders why the Egyptians attacked the fleet even after a truce was already concluded with them. Al Harawi studies the log to find navigational data and finds an interesting entry on the log - that the cargo on the hold is destined for Kerak beyond Egypt. The cargo is wood, an item that is embargoed by the Pope. Place the Polestar in inventory. Click/outline the Big Dipper (Ursa Major) and close the cup of the dipper by going back to the star above Dubhe. Follow the path of the shooting star to just under the handle of the Little Dipper (Ursa Minor). Place the Pole Star on the hotspot. B. Using the astrolabe, find the latitude and the location of the Lucina. Click/hold the astrolabe, turn it to line with the Pole Star. 90o - 57o = 33o. Then click on the Lucina on the map. Note: Water has been added in inventory. Al Harawi decides to find more about the mystery behind the embargoed wood and its destination. To do that, he will follow Arthaud in St. Jean d'Acre. The crowd and dignitaries are overwhelmingly gladdened by the arrival of the cargo, which draws more questions for Al Harawi to ponder on. Upon landing on St. Jean d'Acre, Arthaud is greeted with enthusiasm by the Doge of Venice, Pisan Consul, Genoan Consul, Captain of the Court of Chains, Gerard de Ridefort. The prominent greeters try to convince Arthaud that the wood is best stored and bought by their own district. Place the Doge on the Venetian district, Genoan Consul on the Genoan district, Pisan Consul on the Pisan district, Representative of the Court of Chains on the Court of Chain district, Gerard de Ridefort on the Knights Templar district, Knights Hospitaller at the Hospital district, Teutonic Knights at the Teutonic district. In the midst of the squabble as to where Arthaud and the wood is to stay, Al Harawi pointed out that by law, Arthaud is the sole owner of the wood and that it can then be auctioned at the caravansary, thus earning the trust of Arthaud. Al Harawi also managed to carry off the logbook of the Lucina. By the ship, Italian financiers and a pilgrim watch the unloading of the cargo. In an alley, a settler from Caesarea discusses the auction with Armenians. Agnes de Courtenay, mother of King Baldwin IV wonders about the auction's buyers with her lover, Heraclius, the Patriarch of Jerusalem at St. John's Hall. The caravansary is filled with buyers examining the wood, among them are the Doge, Gerard de Ridefort, Emir Al-Aziz Uthman, Emir Al-Afdal Ali, crusading Knight, Byzantine merchant. Place the following buyers on the respective places: Armenians from Little Armenia, Byzantine merchant from the Byzantine Empire, Pilgrims from the Kingdom of the West, Italian merchants/financiers from the Kingdom of the West, Knights from the Kingdom of the West, settler from the port of Caesarea, Emir Al-Uthamn from Egypt, Emir Al-Afdal Ali for the Kingdom of Damascus, Raymond of Tripoli for Antioch and Tripoli and place last, Reynald de Chatillon for principality of Outrejourdain. To the disappointment of the buyers with the exception of Gerard de Ridefort and the Doge, Reynald de Chatillon comes to the auction and carries off the wood. The city speculates on the naming of the successor to Baldwin IV. At the caravansary, Reynald de Chatillon issues an invitation for Arthaud to come with him to Kerak where the woods are to be delivered. The court at St. John's Hall is filled with anticipation of knowing the successor to the King. Among those present are King Baldwin IV in his covered litter talking to his mother, Agnes de Courtenay. Little Baldwin plays and his uncle Guy de Lusignan talks about favoring the Party of the Court against Saladin. A. To determine the succession, fill in the missing name of the family Tree of Baldwin IV. Place Guy de Lusignan on Z1, Reynald de Chatillon on Z2 and Baldwin V on Z3. B. Determine the 2 opposing parties of the Court in Jerusalem. Place in order for the Party of the Court - Agnes, Reynald, Lusignan and Sibylla. Place in order for the Party of the Barons - Raymond III of Tripoli, Baldwin IV and Baldwin V.
King Baldwin IV chose little Baldwin, who is only 5 yrs. of age to be his successor. To the dismay of the opposing party who left the court in defeat, Raymond of Tripoli was nominated to be Regent until little Baldwin comes of age. Arthaud realizes that during the coronation of little Baldwin next winter, the Holy Relics will be displayed and would be less guarded. One night, while following Arthaud, Reynald and Gerald, Al Harawi was attacked by assassins but was saved by Arthaud. In the fight, Arthaud was seriously wounded, possibly with a poisoned weapon. Throughout the city, the talk is of the sect of Assassins, poisoned weapons and the survivability of the wounds inflicted. In the caravansary, merchants sell their wares, like poppy, honey and wine. Al Harawi brings Arthaud to Maimonide, a renowned physician for treatment. In Maimonide's quarters, a curette and needle can be found. Place 1) the stylet - explore, 2) Curette - evacuate, 3) Cautery - disinfect, 4) Neddle - sew. Place the 1) mandrake, 2) poppy 3) honey in mortar. Place the powder in the blue jug/incomplete theriac. Al Harawi mourns the debt he now owes Arthaud for his life. He becomes more embroiled in solving the connection between the sect of Assassins mentioned in the logbook he still carries, the embargoed wood and about Venetians and the Knights Templar. To do so, Arthaud still in agony, must be healed. Throughout the city, talk of the mysteries of Alchemy is discussed. In the caravansary, merchants sell wine and other goods. At Maimonide's quarter, Arthaud is still in great pain and is need of more that the usual medical treatment. By the window lays his pouch filled with gold from the auction of the wood. A. Arrange the Magic Square to total in every line to the number of years Arthaud was entombed mutiplied by 5. 15 (3 yrs. x 5) need to be arranged. B. Prepare the alchemic remedy. Place the magic square and the gold in the mortar. Place the powder in the still and then add wine. Maimonide wonders at the good fortune in gold Arthaud carries and was informed that it was from the sale of wood to Reynald de Chatillon. He then informs Al Harawi based from Abraham's news, that Reynald has ordered the Tomb of the Patriarch in Hebron, a holy Jewish site, closed to the Sons of Israel. Arthaud with Al Harawi watches the preparations for the trip to Kerak. Turcopoles and camels pass through St. Jean d'Acre. Knights Templars drinking wine in the alley discuss the need for guides for watering holes for the trip. Maimonide wish that the trip be safe. Place the Routes in the East on the Via Maris marker, the camel on the Routes, the Knights Templar on the fortresses, the Bedouins on the watering holes and the Turcopoles on the Risk of Ambush. B. Trace the route to be taken with 5 strongholds and 4 waterholes stopover. Trace the route from Acre, Haiffa, Caesarea, Nablus, Jericho, Jerusalem, Bethlehem, Hebron, Paumier and Kerak. Note: Earth has been added in inventory. The wood escorted by the Knights Templar led by Gerald de Ridefort travels to Kerak. 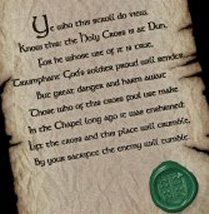 Al Harawi realizes that with the wood and alliance with the Doge, Reynald de Chatillon and the sect of Assassins will bolster Gerald's plans to weaken Baldwin IV and gain Templar's hold on Holy Sites. Arthaud is still oblivious to the plans surrounding him. Guards inside the fortress discuss the need for stores in event of attack. Terracotta tiles lie beside the wood that arrived at Kerak. Outside at the ramparts ovelooking Kerak, flocks of sheep, craftsmen, shopkeepers, Aleppan engineer are in the market place. At the Castle keep overlooking the town of Moab, Reynald informs Arthaud of his plans to attack Mecca and take the Black Stone. Using his alliance with the Knights Templar, Venetians, Ishmaelite, Outrejourdain, Reynald will form a mighty army. He offers a fifth of the shipping lanes in the Red Sea to Arthaud for him to join them. A light warship is being built in the great hall using the bought wood beside a store of olives. Place the herd of sheep with the 1) Skinner and then place the carcass on 2) Butcher. The dried meat will be automatically be placed in the storage shelves on the right of the screen together with the dates. Place the olive on one of the presses to get oil. Place vines on the other press to get wine. Place the cereal on the windmill to get bags of flour/cereals. Place the bags of flour/cereals on the smokehouse/oven to get bread. Place the sugarcanes on the basket weaver to get sugar loaves. Place the roof tiles and gutters on the Byzantine engineer to build canals and drainage system. Al Harawi ponders on Reynald's desire to hold the 2 most precious treasures of the East, the Jewish Temple of Abraham and the Islamic Black Stone on Mecca. This plan met an obstacle when Saladin attacks Kerak thus hindering Reynald's plans. Saladin's arrival is timely. Hmmm! At the castle postern, fierce battle is going on, planks of wood littered the ground and atop the walls, a carpenter-caulker is busy trying to build a roughcast to protect the walls. Outside the walls, Qayraman and Dalaymites shoot arrows at the castle walls, while others build a catapult. Reynald atop the keep orders the dismantling of the unfinished ship to use wood on shoring the forecastle on the walls of the fortress. At the Great Hall, the carpenter-caulker and other men dismantles the ship. Build a roughcast by placing the 1)Aleppan engineer on the compass and square, 2) Carpenter-caulker on the saw and axe, 3) Planks on the pins and beams, 4) Cowhides on the firefighting. Saladin and his army realized that it was not going to be easy taking the fortress. Greek fires are now thrown to burn the walls down. The winch man cowers at the castle postern. Outside the walls, the Caragulahm shoots arrows and the catapult throws Greek fire. A Damascene engineer adviser to Saladin watches the building of trebuchets. Atop the castle keep, Reynald is furious in his decision to use the wood for his ships for seige machines. Beside him is a catapult and projectiles. At the Great Hall, more catapults are being built, a winch man is helping and an iron rod not yet fitted lays on the floor. Place the iron rod close to the right front wheel of the catapult and the fur padding on the crosspiece. Place the projectile on the spoon and the winch man beside the rear right wheel of the catapult. Reynald's catapults were not enough deterrent to Saladin's war engines. Saladin's experienced army and sappers fills the ditches around the fortress and are gaining in their attack. 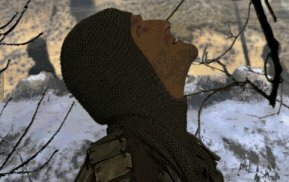 Reynald realizes that he needs assistance from the Royal Army 50 miles away in Jerusalem. He burns his precious wood to build a giant bonfire atop the castle keep to signal for help. Ironic isn't it. The Postern has been damaged by the bombardments. Outside the walls, the Faris and the Sudanese shoot arrows. The cat-castle protects the men filling the ditches and the catapults continuously throw projectiles on the wall. Reynald realizes that assistance might not come and decides to send Arthaud for aid and for that the postern needs to be rebuilt. The Great Hall is littered with wounded. 1) Place the hoist in the Hoisting area at the middle right of the structure. 2) Connect the chains to the hoist. Click the end of the chains on the pulley just above the hoist and then on the metal area on the left, where the chain divides and then to the pulley on the very top of the structure. 3) Place the counterweight on the end of the chain. Now, turn the winch to lower the bridge by clicking and rotating counterclockwise continuously. Reynald realizes the danger to the Christian camp and decided not to rely completely on the reinforcement from Jerusalem. Knowing that Saladin's army is made up of various tribes, he decides to undermine within by sending Al Harawi to his Moslem Allies in the midst of the opposing army. He sends Arthaud to accompany Al Harawi. Reynald and Gerard discuss the animosity between the various tribes in Saladin's army. On the top of the castle walls, one of Reynald's envoys sends a signal that is received by a responding light signal from Saladin's camp. Below at the camp, Arthaud and Al Harawi creep about. At the Great Hall, a pharmacist aids the wounded. Place Faris and Caragulahm on cavalry, Qayrawan on light cavalry, Sudanes and Dalaymites on infantry, Ghazis and Mutawiahs on religious volunteers, craftsmen and shopkeepers at the Souk, Maimonide, Imam and Damascene engineer at Men of Science, Pharmacist and Surgeon at Medical personnel, Mamelukes in the personal guard and Saladin in his tent. As soon as Arthaud enters the Bedouin camp, Al Harawi hits him on the head to render him unconscious. Upon waking, Arthaud realizes that Al Harawi is Saladin's spy. Studying the loosely coded message, Arthaud was carrying, Al Harawi finds that Reynald asks the sect of Assassin to kill Saladin and little Baldwin and to kidnap Arthaud and place him beside the body of the young king-to-be, so that he can be accused of the murder. Maimonide, personal physician to Saladin, notes that the army is weary and dissent is getting stronger, his people are facing famine and advises Saladin to have years of rest before they face Reynald's forces again. Al Harawi emphasizes the threat to the East by Reynald's plans for the Tomb of Abraham, Black Stone and to the City of Jerusalem. He also advises an alliance with Baldwin IV against Reynald's forces and cohorts. Saladin spares Arthaud's life based on the report of Maimonide in his saving Al Harawi's life. Saladin sends Arthaud on a mission to stop the threat by Reynald and cohorts and seek a 4 year alliance with Baldwin IV. He also sends Maimonide to treat Baldwin IV of his leprosy. Place Agnes de Courtenay as the Black Queen, Reynald de Chatillon as the Black Rook, Gerard de Ridefort as the Black Bishop. Place Saladin as the White Knight and Baldwin IV as the White King. Then move Arthaud as White Bishop diagonally against the Black King (right in front of the Black Bishop) and the succeeding automatic movement will checkmate the Black King. Click on Checkmate. Note: Air has been added to the inventory. Between the siege of Kerak and the facing Raymond of Tripoli's army, Saladin lifted the attack on the garrison. With Reynald de Chatillon's desire to control The Tomb of Abraham, the Holiest site of the Israelites and the Black Stone, the symbol of the Moslem World and now to attain Jerusalem, with the Relics of the Holy Cross, the Christian World's holiest object, he would have all the 3 Main religion in his grasp. And when he brings them all within the walls of Kerak, his control is absolute. Al Harawi and Arthaud travel to Jerusalem, to present the offer of truce to Baldwin and to thwart the treat to little Baldwin. On Mount Olives, overlooking Jerusalem, Al Harawi tells Arthaud that Reynald's message that he was carrying was surely duplicated by means of carrier pigeon to the Assassins, therefore the threat to little Baldwin still exist as well as the order to slay Al Harawi. They can hear the start of the coronation procession from the Tower of David to the Temple of the Lord. Place Baldwin IV at the Tower of David, Agnes de Courtenay at the Manor, Heraclius at the Holy Sepulcher, Levantine Christians at St. Anne's Chapel, Abraham at the Dome of the Rock, Gerard de Ridefort at the House of Templars, Knight Hospitaller at the Hospital, Teutonic Knights at the Saint Marie of German Knights, Royal Militia at the Tower of Tancrede, religious souvenir sellers at St. Etienne Street, Italian financiers at the Money Exchange. From the Tower of David, go E, N, E, S, E, E, E to the Dome of the Rock. Al Harawi and Arthaud bid each other farewell outside Jerusalem. Arthaud goes by underground passages beneath the city, to reach the Temple of the Lord where little Baldwin is undergoing preparation before coronation. On the Altar, before little Baldwin are the Crown jewels and the relics of the Holy Cross. Arthaud is at the heart of the cave, waiting. At the Holy Temple of the Lord, little Baldwin meditates in front of the Altar; Heraclius blesses the Crown Jewels, while Agnes de Courtenay and Gerard de Ridefort watch. All of them are oblivious to the entrance of the Assassins in the room. Place the 10 Shahada on the 1st Pillar of Islam - the profession of Faith, 2) prayer mat on the 2nd Pillar of Islam - the Prayer, 3) beggar on the 3rd Pillar of Islam - Zakat, 4) Crescent (half-moon) on the 4th Pillar of Islam - Ramadan, 5) Black Stone on the 5th Pillar of Islam - Pilgrimage to Mecca. Then, place Angel Gabriel on the Cupola of the Mosque. By Divine Intervention, the Assassin's attempt on Baldwin V was thwarted. Gerard de Ridefort returns to steal the Relics and seizes Arthaud as he was coming up from the cave to the temple. Gerard de Ridefort incarcerates Arthaud at Solomon's Stable and tells him that he is suspected of trying to kill the little King and demands that Arthaud tells him where the real relics are. Place the symbols for he, yod, he, aleph. Then place the candle/Hanukah lamp on the empty candle holder on the right. Arthaud contracts leprosy. Abraham appears before him. Abraham, the last Rabbi allowed in Jerusalem is also confined by Gerard. Gerard wants Abraham to reveal information on how to enter the Tomb of David and its treasures. Abraham will guide Arthaud to the Holy Sepulcher where Baldwin IV is. Abraham emphasizes the word EMET, meaning truth. Place the symbol tau, mem, aleph on the forehead of the golem. Abraham makes a golem. The golem awakes and carries Arthaud through underground passage to the Holy Sepulcher. Here, Maimonide treats King Baldwin IV and Al Harawi waits. Overlooking Jerusalem at Mount Olives, a shining crucifix is on top of the Dome. Inside the Temple of the Lord, a candelabra and Heraclius' crosier is by the altar. While at Solomon's Stables, Gerard, agitated by Arthaud's disappearance is being calmed down by Heraclius. At St. Helen's Crypt, Baldwin IV tells Arthaud that he is aware of his intentions and he will attain his goal only if Christ comes to his aid. Place 1) Cross at the Tomb of Christ, 2) Crosier at the Navel of the World, 3) Chalice at the High Altar, 4) Ciborium at the staircase, 5) Candelabra at Ste. Helen's Chapel. Baldwin IV accepts the truce with Saladin presented by Al Harawi. He informs Arthaud with partial truth about the Relics - that fearing the threat to the Holy Relics, he made several copies and sent the True Ones with William of Tyre to conceal in France. William hid the Relics in the same tomb where Arthaud stayed for 3 years. Unbeknownst to Arthaud, now in advanced stages of leprosy, he is followed throughout his travel back to Dun-Le-Roy. Dun-le Roy looks so bleak in the dead of winter. While on his knees and praying in front of the opened tomb, Arthaud notices the passage of men outside the chapel. Riddle 26 - The Chi-rho: Place the 4 elements in the proper place. Place on top left - Fire, top right - Air, bottom right - Water, bottom left - Earth. In the chapel, turn the supporting pillar of the middle arch by clicking above the block, moving right to left until the Ourobourus/snake is revealed. Place the Ouroborous/snake at the center of the 4 elements. Arthaud knows that by lifting the Holy Relic from its place in the tomb, he will perish together with those who trailed him. They want the Holy Relic for themselves. He sacrifices himself so that their greedy hands will not get hold of it. Philippe shrewdly sent him to Jerusalem to unmasks these threats to his Kingdom and had no intention of meeting Arthaud at Dun-le-Roy after one year of his promise. Baldwin IV finally dies of his illness and Saladin gains possession of Jerusalem. On the 2nd of October, 3 yrs. after, Philippe and Richard the Lionhearted start on the Third Crusade. Be it known that Arthaud, last Lord of Dun-le-Roy died heroically and his sacrifice has attained Supreme Redemption. As reported by Al Harawi, master spy and storyteller.